The land of the Nagas was spread over India and Myanmar after India’s Independence, with much of the original Naga hills inculcated into Manipur, Assam and Arunachal. While many decrie the internecine violence among the insurgent factions, even senior government officials such as Nagaland Chief Minister Neiphiu Rio, support the insurgents' goal of autonomy for a greater Nagaland, incorporating Nagas from other Indian states and even in Burma. For many years, the Naga National Council (NNC) under Angami Zapu Phizo, and with Chinese and the then undivided Pakistan support, fought a bitter war for Naga independence. Insurgents continue to maintain excessive influence in the Nagaland, running shadow governments in the areas under their control. What may have started as a political movement for Naga independence has devolved into something more akin to organized crime supported by extortion and intimidation. The local political parties' willingness to align themselves with the insurgents and to use them for their political ends means that no effective efforts are being taken to reduce the insurgents' grip on Nagaland. The Center Government sees Nagaland as remote and of limited economic or political significance and so is willing to let the lawlessness fester, anticipating that the profiteering will corrode the desire for Naga independence. The Naga community consists of 17 major tribes and at least 20 sub-tribes. They inhabit primarily the present state of Nagaland, and areas in Manipur, Assam, Arunachal Pradesh and Burma. U.S. missionaries' conversion of the Nagas and missionary school education weakened the exclusive clan allegiance of the sub-tribes and fostered the growth of a pan-Naga consciousness. The creation of a Nagaland state in 1963 failed to contain militancy and the Naga insurgency has resulted in 20,000 deaths in Nagaland since India's independence. Inhabited by 16 tribes, Nagaland has its own distinct culture and ethos. Happy and cheerful, the people have an innate sense of music and color. All the land here is basically owned by villages and individuals and this is true of many areas of the North-East and, therefore, one rarely hears of land disputes and clashes. Gateways to villages and houses are really something to see. Nagaland grows a fair amount of oranges and pineapples. The all-prevalent green continues and the scenic beauty of the state overwhelms. Christianity has had a profound influence on the region, and one sees well-maintained churches all over. The Angamis were never ruled by chiefs; the closest equivalent is the Tevo, a descendant of the founder of the village and mediator between the community and the supernatural world. Each village is sub-divided into khel, which in the past often had independent inter-tribal policies, and who settled their own disputes by bloody fights. Relations between the sexes traditionally were conducted with great openness and equality. Few first marriages led to a permanent union, and in spite of the Christian influence divorce remains common. Although each tribe has its own dialect, a pidgin drawn from various Naga languages, Assamese and even Nepalese, has developed into the common Nagamese tongue. As the Nagas have been integrated into the modern world, their traditions are under threat. In an effort to realign society along so-called civilized lines, boys are encouraged to live at home with their parents, and morungs are discouraged and left to fall into ruin. Nagaland has had a troubled political history for many decades, with insurgency pre-dating statehood. The Naga insurgency is India's longest running internal conflict. The British and waves of Kuki immigrants arrived simultaneously in the 19th century, the latter colonizing in Zemi territory and other areas in the hills and lowlands. Intense rivalry for possession of land developed. The British administrators of Nagaland who arrived at a truce with the Nagas towards the end of the nineteenth century, agreed not to penetrate beyond certain boundaries, so their maps left numerous blank areas. Based in the Angami village of Kohima, the Deputy Commissioner occasionally toured the territories to collect taxes and administer justice and came to hold a certain authority among the various tribes. Some developed a loyalty to the British, others saw them as intruders. In 1879 loyal Kohima Angamis who helped to smuggle a message through to British lines in the Assam Valley relieved the Khonoma Angami rebellion against Kohima through assistance. British formed the first Naga political organization called the 'Naga Club' in Kohima in 1918 with a view to assisting the deputy commissioner in understanding the socio-administrative problem of various tribes. In 1918 the Kuki people rebelled against the British. In 1928 the Kabui, Zemi and Lyeng members of the Kacha Naga, who had many grudges against the Kuki, planned a full-scale massacre of them, but were prevented by the British. In 1931 the Kuki aided the British in subduing the Kacha. For some generation there had been a local prophecy that a Naga king would arise one day, drive out the British and establish rule over "all who eat from the wooden platter" (i.e., the Naga tribes). In 1929, a Zemi tribesman from Kambiron named Jadonang proclaimed himself this Messiah. His ideas combined elements of Christianity, Hinduism and Zemi priestcraft. Eventually his followers resorted to human sacrifice and he was hanged by the British. Jadonang's chief priestess and disciple, a sixteen year old Kabui girl, survived, however, and established herself as a goddess. Amassing enormous tribute and securing allegiance of all of the Kacha Nagas, she proclaimed a Naga Kingdom in 1931 and planned a massacre of the Kuki. The Kuki aided the British in subduing the Kacha and the girl was jailed for 14 years (at direction of J.P. Mill , Naga authority who was then Deputy Commissioner at Kohima). Since that date, however, the Kacha Naga movement for Naga independence continued in various forms. Inspired with the success of Pakistan movement a section of educated youth of Christian missionaries and support of some foreign powers expressed their reservation against amalgamation of Naga territory with Indian Union. They also started pleading that Nagas are a separate Nation. (They converted the Naga Club into a political organization known as Naga National Council (NNC) submitted a memorandum to the British Cabinet Mission on 19 June 1946, when it demanded autonomy of Naga Hills. When the Indian flag replaced the Union flag in 1947, it was promptly removed by Nagas, who had come to accept the British presence(Crown Colony) but did not want to join India. When India became independent in 1947, the Nagas (then inhabitants of the Naga Hills in undivided Assam) were unwilling to be part of the new republic, considering themselves distinct from Indians, and launched an armed struggle for a sovereign Naga homeland. Insurgency came to the Naga Hills under the aegis of the NNC led by the legendary Angami Zapu Phizo, who raised the banner of revolt against the Indian government on August 14, 1947. What had begun as a non-violent struggle for self-determination later took the form of a violent and armed conflict in the 1950s. 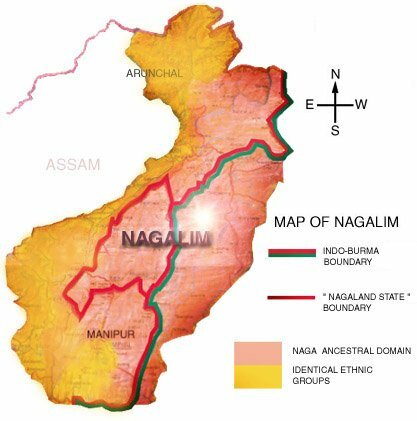 For decades, Naga rebel groups had been fighting for Nagalim or Greater Nagaland. Naga insurgents received training from China and Pakistan in the 1960s and 1970s, with some insurgents trekking across Burma to reach southwest China. The Naga National Council (NNC) under Angami Zapu Phizo initially led the early revolt. Concerned over the continued violence, the Nagaland Baptist Church Council initiated peace efforts. This took concrete and positive shape during its Convention in early 1964 and the historic Peace Mission was launched the same year. The relentless endeavor of the Peace Mission actively supported by the Church resulted in an agreement for cessation of fire, on May 23, 1964, which came into effect on September 6. Several rounds of talks followed, including at the Prime Ministerial level, but the talks finally deadlocked, and the ceasefire was effectively over by 1972. The Church, however, continued with its peace efforts and formed the Nagaland Peace Council in 1972. In 1974, a section of Naga National Council (NNC) broke away and, as the United Democratic Front, won election to the state government, then signed the Shillong Accord and laid down their arms. Three years of efforts resulted in the Shillong Accord of November 11, 1975. NNC moderates accepted the Indian Constitution following the Shillong Accord with New Delhi. Active fighting resumed in the eighties. The rump of the NNC fought on, splitting in 1980 when Phizo's lieutenant, Thuingaleng Muivah, Ishak Chishi Swu and SS Khaplang broke away to form the National Socialist Council of Nagaland (NSCN) demanding a greater Nagaland encompassing all Naga inhabited areas in India's northeast. NSCN split in 1988 with one faction under Isak Chisi Swu and Thuingaleng Muivah and the other led by S. Khaplang. The NSCN (Isak-Muivah) (NSCN-IM) emerged as the more powerful of the two factions. SS Khaplang faction is still fighting but with one year ceasefire I-M group came to negotiation process with Indian government. In 1993, Nagaland experienced recrudescent violence as two ethnic groups, the Nagas and the Kukis, engaged in brutal conflict with each other. Adding to India's internal unrest in this region were the links established between the Bodo insurgents in Assam and the National Socialist Council of Nagaland, which, in turn, had links to other active insurgent groups and, reportedly, operatives in Thailand. The Centre had been in talks with NSCN(IM), the largest Naga rebel group, since 1997, when the group signed a ceasefire. On 25th July 1997, the Government of India announced a cease-fire with the National Socialist Council of Nagaland (Isaac-Muivah) with effect from 1st August 1997—the NSCN had split into two groups in the latter part of the 1980s. On August 1, 1997, a ceasefire between the Government and the ISAC-Muivah faction of the NSCN (NSCN-IM) went into effect and has been largely observed by the Government and all insurgent groups in the state. However, factional feuds among rival Naga insurgent groups claimed an estimated 120 lives during the first 3 months of the ceasefire. The Government extended the ceasefire for another 3 months on November 1, unilaterally including even those armed groups in Nagaland which had not been party to the original ceasefire. During the latter part of the year, the cease-fire was extended through July 31, 2000. In May 1999, underground Naga leaders Isak Chisi Swu and Thuingaleng Muivah, chairman and general secretary respectively of the NSCM-IM, visited Nagaland for the first time in 33 years. The Government asked the NSCM-IM to define the geographical boundary of "Nagalim" to enable it to extend the cease-fire zone to these areas. On August 18, the NSCM-IM killed Dally Mungro, general secretary of the Khaplang faction of the NSCN, along with two of his associates. The ceasefire was extended in January 2000 until July 31, 2001. In April another Naga insurgent group, the National Socialist Council of Nagaland-Khaplang (NSCN-K) -- the arch rival of NSCN (I-M) -- announced a formal ceasefire. Security forces were not operating against either of the two NSCN factions and both generally were observing the ceasefire with security forces. However, in April 2001 week-long fighting between the 2 NSCN factions left over 45 persons dead, and 4,500 persons were forced to flee 15 villages in Mon district. Negotiations to widen the area of application of the ceasefire were handicapped when NSCN(I-M) leader Thuingaleng Muivah was arrested in Thailand on January 19 for travelling on a forged South Korean passport. On August 25, a joint group of Thai and Indian citizens appealed to the central Government to secure the release of the NSCN(IM) leader in the interest of Naga peace talks. He was released on bail in September 2001. Between January and May 2001, there were 31 insurgency-related incidents in Nagaland in which 4 civilians and 17 militants were killed. The Government's negotiations with Naga separatists over a cease-fire caused significant unrest in Nagaland and in neighboring states. In one incident in June, police fired teargas shells into a crowd of more than 10,000 demonstrators who were protesting the extension of the Naga ceasefire beyond Nagaland's borders at Nambol in Bishnupur distict of Manipur; police also attacked demonstrators with batons. At least 35 persons were injured. These cease-fire agreements led to the generation of optimism, hope and creation of a supportive macro environment. Government and the civil society are engaged in a purposeful conversation aimed at societal development. People of the State are desirous of permanent peace. They are willing and eager to contribute to the process of change. The prolonged insurgency and periods of violent conflict have left their mark on the governance experience. A visible effect has been the widespread presence of armed forces in the region, which has in fluenced the development experience and worldview of the society. It also hampered the State’s efforts at decentralisation of development administration and weakened the monitoring mechanisms. The administration has had to spend much energy and resources to deal with political and insurgency-related problems. Officials, particularly in the field, in the distant areas far away from the capital, have had to perform under the most difficult of circumstances. Caught between the imperative of asserting the rule of law while at the same time having to face the consequences of the continuous insurgency, it has not been easy to maintain the balance between ensuring development and also maintaining peace. The Institute for Conflict Management's provisional data for 2007 indicated that of the 108 people killed by insurgency violence, 88 deaths were from intra-factional insurgent fighting. The NSCN-IM was closely linked with CM Rio, his Naga People's Front (NPF) and the NDA and the NSCN-K is linked with the state Congress Party. The political parties use the Naga factions to support candidates in the constituencies by intimidating voters and extorting funds. The South Asia Intelligence Review (SAIR) reported in December 2007 that the Naga insurgents operate "unhindered in the townships and country-side, enforcing their groups' diktats across Nagaland. Intelligence reports indicate that the cadre strength of the NSCN-IM has increased from 800 to about 2,500 since the July 1997 cease-fire announcement. The outfit's well-oiled `finance department' engages in wide-spread `tax-collection' activities and its `home department' virtually runs the State administration. Its `crime suppression department' ensures control of its areas of dominance, administering a selective `justice' over various `offences.'" The Centre had been in talks for Greater Nagaland with the National Socialist Council of Nagaland-Isak-Muivah (NSCN-IM), the largest Naga rebel group, making the issue one of the biggest poll plank in the state for decades. In 2015, these talks got a boost after Prime Minister Narendra Modi signed a “framework agreement” with the NSCN(IM). In 2015, interlocutor RN Ravi signed a ‘framework agreement’ with the NSCN-IM on behalf of the Centre to end the decades-old insurgency. It was signed at Prime Minister Narendra Modi’s residence. While details of the framework agreement have not yet been made public, it is believed to acknowledge the “uniqueness of Naga history and culture” in exchange for NSCN(IM)’s respect for the “primacy of the Indian constitution”. But, with no progress made, in January 2018, at least 11 political parties joined hands to boycott the elections until a final solution on the agreement was taken. However, on 03 February 2018, Ravi wrote a letter to the Naga groups, including the NSCN-IM, assuring the groups that the new Assembly would not come in the way of the final agreement. The letter reportedly helped end the impasse over the elections. Consequently, the BJP became the first party to defer the boycott agreement – and the rest followed suit.